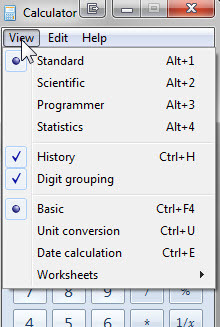 The calculator built into Windows is much better than most people believe. With just a few tweaks, and you can make it a great tool. Do a search to bring up the calculator or find it under Accessories. 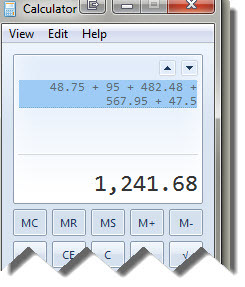 If you pull down the View menu you'll see that you can select any of four different types of calculators. If you check the history box, it will record the numbers you type. Once selected, it remembers the next time, so whenever I bring up the calculator, it has a tape for me to check the numbers I enter. This tape can be copied to the clipboard with Edit>History>Copy History. If you got a number wrong on the history list, just go in and edit it (Edit>History>Edit) and correct the mistake in history. Your answer will change to reflect the new history. In addition to a regular calculator, it has a large number of unit conversions (grams to pounds anyone?) and a date calculator. The worksheet provides a mortgage calculator, fuel economy and lease calculations. These are all available from the View Menu. Sadly, there is no print function, but you can copy from the Edit menu and paste to a document and print from there.